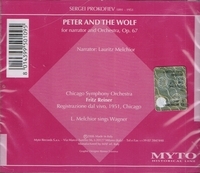 “While the main feature on this disc – Prokofiev’s PETER AND THE WOLF, Live Performance, from 1951 NBC Symphony (mis-labeled Chicago Symphony), with the great Wagnerian heldentenor Lauritz Melchior – might be construed a sophisticate’s party-joke, especially since Melchior hams up the various animals’ parts and spruces up the narrative with asides, the performance provides a rare glimpse into the broad and generous personality of this world-class singer. The poor quality of the recording will put off audiophiles because of its insistent crackle, swish, and even the presence of some other audio source not fully eliminated from the original. The playing of the NBC Symphony, however, is as accurate as William Tell’s arrow. Melchior’s palpable interaction with the audience, his geniality and tongue-in-cheek humor, are delightfully transparent. The Danish accent and avuncular pose make this a treat for music lovers of all ages. The remainder of this anomalous CD is devoted to 1929-1930 Wagner inscriptions, via German Electrola and Ultraphone. These are marvelously clean transfers, with Melchior in strong, sweet voice, always resonant and augmented by clear diction.